The chapter has a nice color of the entire crew having the straw hat pirate skull in black paint on. 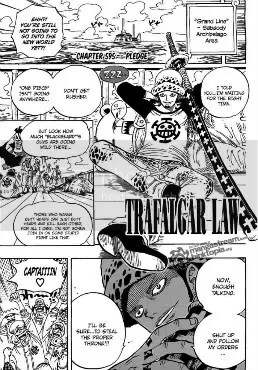 Trafalgar Law is refusing to go into the New World like the other Supernovas are. Law says that he’s waiting for the right time. Could he be waiting for the Strawhats crew to reunite and cause ruckus before heading to the New World? The New World is seen as a place that is the exact opposite of paradise. Filled with all sorts of danger, even the Supernovas are having a bit of trouble. This makes me wonder if the Strawhats would be able to withstand the New World. 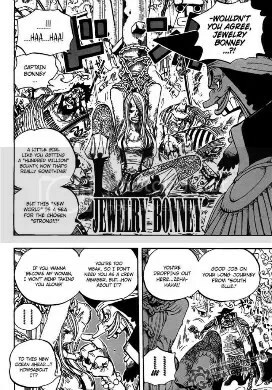 And to my surprise, Jewelry Bonney is held captive by Blackbeard and is to be handed over to the Mariners in exchange for a certain boat [I think it was a boat that Blackbeard wanted]. Jewelry being captured makes me think that something big will happen when the Mariners take her back to Marineford Headquarters. But I was like– ‘Heck Yes’ when she kicked him in the face after he said that he wouldn’t mind having her as his woman or something like that. He deserves that kick. Chopper returns to the Torino Kingdom to better his medical skills and gain more knowledge in hopes of never experiencing a separation from the crew again. Sanji begins to form the idea of strengthening the crew’s bodies through the food that they eat. Members of the Strawhat Pirates are each developing their personal unique area of ability to become better and stronger. It is good that they are each getting stronger but that means that they’ll all be separated a bit longer. Until when will they be able to reunite and continue their quest of reaching One Piece? This entry was posted in Manga, One Piece, Reading Right Now and tagged eiichiro oda, Strawhat Pirates. Bookmark the permalink.